We joined the rugby tour in Auckland and left on a bus. It was a pleasant change from driving, having done just over 2000 miles in the previous two weeks. We drove back down the Southern Highway and past Huntly but then turned off through Morrinsville amid dairy farming country and had a break at Matamata. It has achieved fame as the film set for Hobbiton in Lord of the Rings. You can tour the film set for $99 if you wish. We had a quick lunch and then completed our journey to Rotorua. The lake is a peaceful oasis late afternoon. 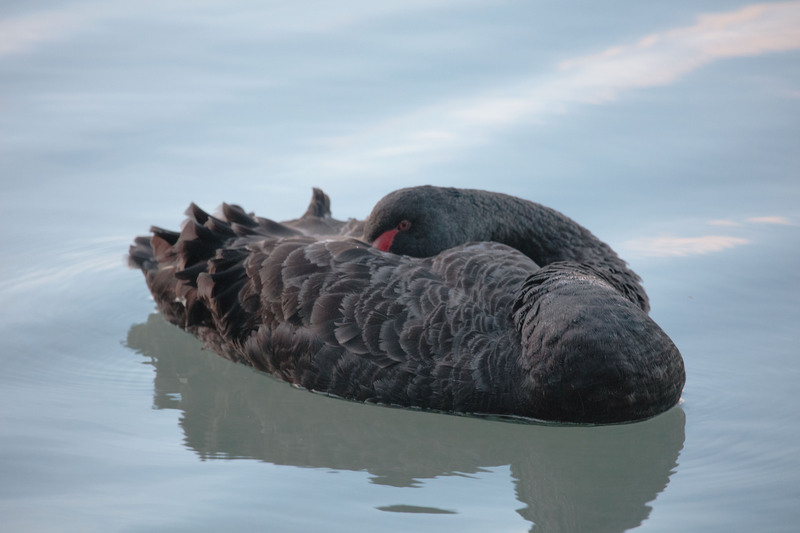 This black swan was just settling down for the night. In the evening, we had a drink in Eat Street. The police and someone from public health were patrolling although it was quiet. As a street pastor back home, it is usually me keeping the streets safe while everyone else is eating and drinking inside so it was slightly strange to be on the other side for a change. Dinner was in a Chinese restaurant where we were the only non-Chinese customers. 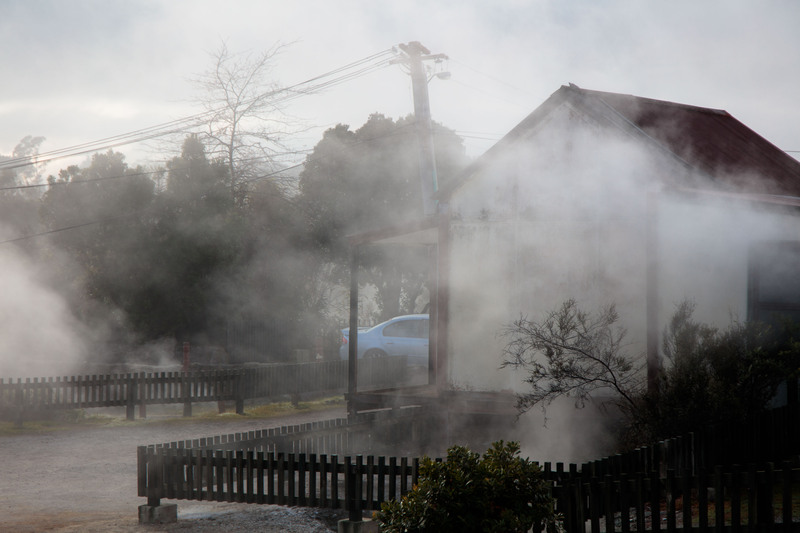 On Saturday morning, we walked out to Whakarewarewa, a Maori village with thermal waters on the south side of Rotorua. The local community cook and bath using the waters. Very gradually they are having to move up the hill as sink holes appear in the very thin crust in the lower parts of the area. 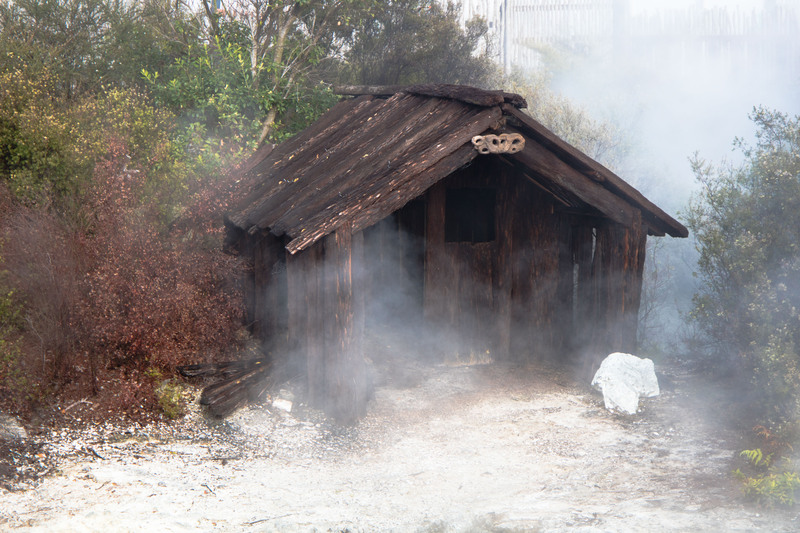 This is an old hut they sued to shelter in on winter nights that is no longer in use. 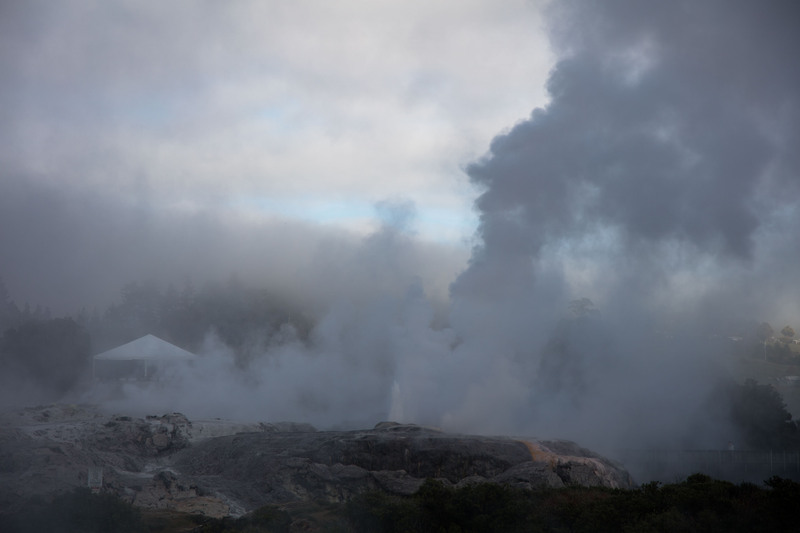 We had a guided tour that lasts for an hour and which was very interesting, covering the geo-thermal activity, the Maori history and culture here. 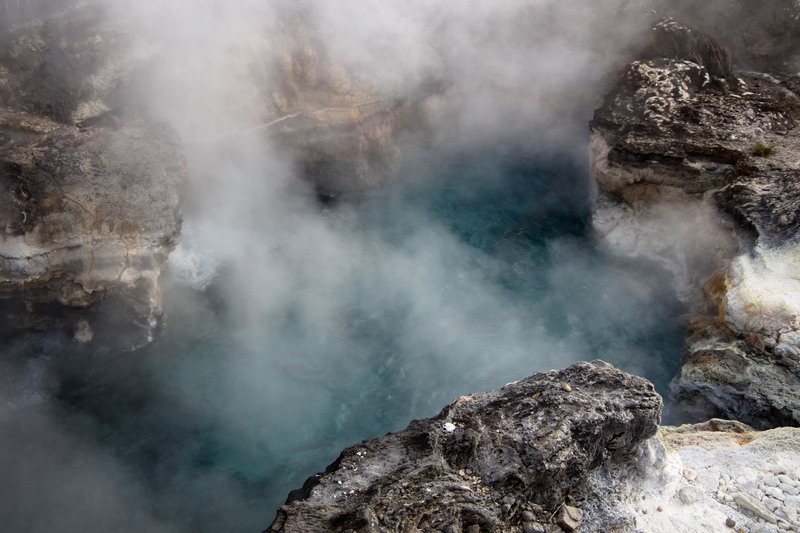 There are other options including cultural performances, dining on food cooked in the thermal ovens and walking trails around the village and lake, some of which we did. 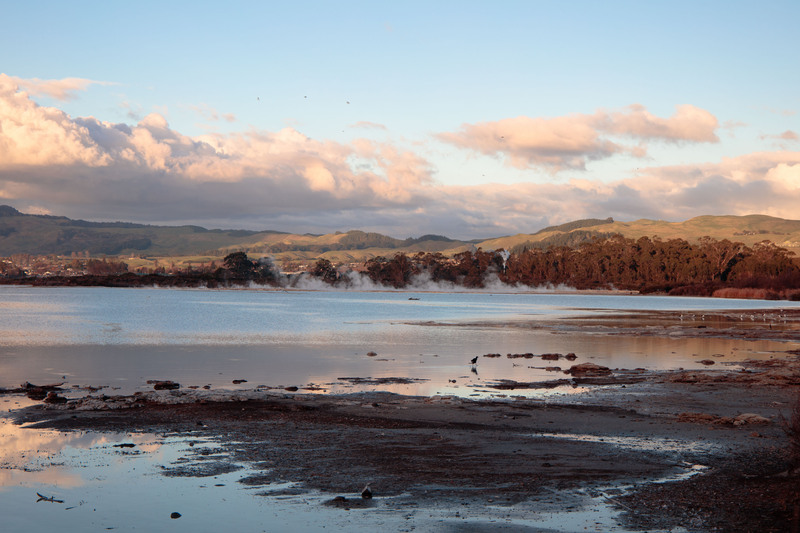 There are two overlooks giving good views of the geysers. We also met a pukeko. The woman who runs the gift shop and looks after around 15 cats, was working in the Chinese restaurant we ate in the evening before and recognised James. The money raised from the entrance fee and tours goes back to the community. 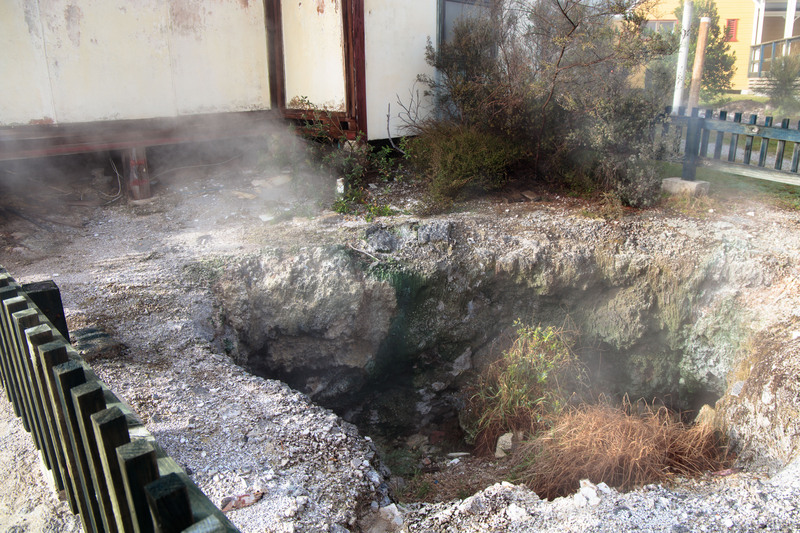 There is a larger, more commercial thermal village a little further down the road which is busier and more expensive. We walked back into town and picked up some lunch before it was time to go to the rugby stadium. I have been to countless rugby matches over the years but the first game was the first women’s match I have seen. England were playing the New Zealand Black Ferns and won as did the British Lions who beat the All Blacks in the second game. It was very wet and I found myself watching some of the media. One guy from the Sky Sports Team was zooming around on a Segway and managing to shoot video at the same time. Other photographers were dumping one camera on the wet grass while they were using the other. It was quite amusing to see that the referee and lines people were sponsored by Specsavers, especially considering some of the decisions they made. Quite a few of the Lions’ fans had stuffed lions, hats and costumes but we met a group of Irish guys, one of whom was dressed as Pink Panther. After the game we eventually found the correct bus back to the hotel and planned a lazy day on Sunday before the next move. Wow – you really packed it in! That’s how it should be done during an adventure such as this one. The only way I’d have fun at one of those rugby games is to be a mascot, a la the fellow who was dressed up as the Pink Panther. 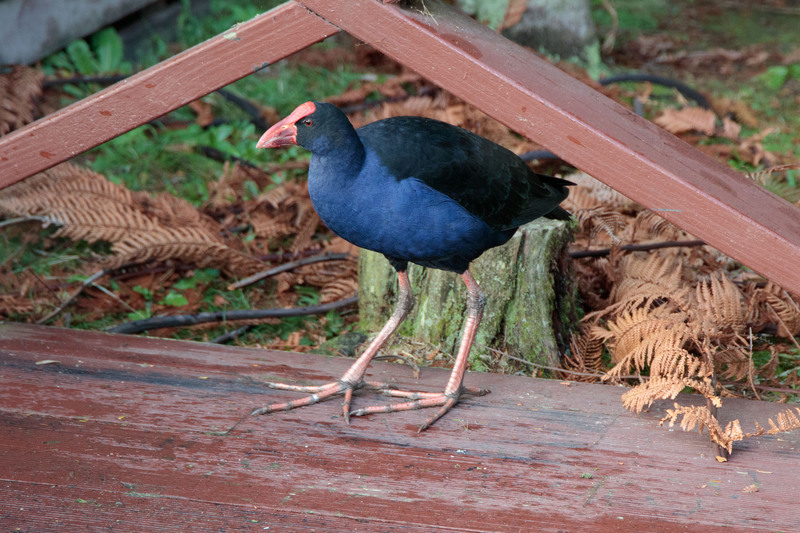 Sadly I’m not a big sports gal…love the pics, especially the pukeko. A fascinating post – I’m enjoying reading the variety of details & observations you include. Hope you took it easy today!